Compressed air is an industry staple - the so-called fourth utility (after water, natural gas, and electricity). It was first used to power drilling machines on an industrial scale during construction of the Mont Cenis Tunnel in Switzerland in the 1860s. For safe use on industrial pneumatic tools, machinery, and other critical equipment, compressed air needs to be clean. A lot of work goes into preparing this air before it is piped to where it is eventually used. It is often wrongly assumed that, since air is naturally produced and available all around us, it is supposed to be cheap, even free. But this isn’t so. Compressed air is actually up to 10 times more expensive to produce than electricity. Much of the expense behind compressed air is due to the extensive preparation it has to go through before it is deemed clean and safe to use. Air produced from compressors is often hot, wet, and full of dirt, or rather, contaminants. The air will need to be cooled, have all the water (itself a contaminant) condensed out, and dirt removed. ● Rust moving parts on key machinery by washing away lubrication, with serious implications on machine operability and product quality. ● Freeze and, as a result, cause clogging risks and machine malfunction. ● Distort the adherence, finish, and even the color itself, when used in spray painting systems. To give precise readings, air used to control transmitters, integrators, relays, converters, indicators, recorders, and gauges must be especially clean. The risks of inaccurate readings on these measuring instruments are serious and can cause production of defective products or failure of the entire industrial system. Actual dirt can be atmospheric dirt (dust and pollen particles), which is sucked in by the compressor right at the source. It can also be particles of varying sizes resulting from corrosion, carbonation, or friction of parts within the compressor. Another source of air contamination is oil leaking from within the compressor itself. All these contaminants will need to be filtered out. Afterwards, the air will need to be adjusted to the right pressure, which should be determined by a particular system’s configuration. Preparation of the air ends with lubrication necessary for operating compressed air systems without wear or excessive resistance. The whole air preparation process is collectively known by the acronym FRL (filter, regulator, lubricator). The system can be used as one combined unit or the filter, regulator, and lubricator can each be deployed individually on the airline. Combination FRLs are sold pre-assembled and can be preferred for the amount of time they save on installation. The combinations can also be 2-piece - filter and regulator, with the lubricator coming as an independent component. Before the air can be compressed, you first have to establish the level of contamination the process, for which the air is used, can handle. Only then, can the right filter be selected. Filter sizes have to be proportional to the volume of air needed at any particular location. Using the wrong filter size results in unnecessary expenditure of energy. These filters are best for removing water and aerosols. Coalescing filters trap small droplets of water and oil and combine (coalesce) them into larger drops for easier removal. They also use a trapping media to filter solid dirt particles. The filters use a barrier to stop all filtered contaminants from remixing with the cleaned air. These filters are quite effective. Their only drawback could be from the trapped solid particles that can clog the filter media, leading to pressure surges. A cheaper alternative to this type of filter is the mist eliminator. However, even though they pose a lower pressure surge risk, these filters do not do a particularly better job than coalescing filters. They are usually used for filtering condensed liquids and aerosols with lubricated compressor systems. This type of filter is typically used to remove gaseous lubricant contaminants that escape through the coalescing filter. These however should not be used to filter liquid matter as they use the adsorption process, where contaminants adhere to an activated carbon filter media (usually charcoal) for filtration. Using this type of filter to remove non-gaseous contaminants will damage it before long. Ideally, vapor removal filters must only be used to clean air that has already passed through a coalescing filter. The two filters thus complement each other, doing what the other cannot. This filter type is used after the air has gone through a vapor removal filter. This is because the adsorption process used for vapor removal filters uses desiccants, which are usually activated carbon, to dry the air and remove all vapor. A consequence of this is the same desiccants can mix with the cleaned air and become a new source of contamination themselves. The technology used for dry particulate filters is largely the same as that used for coalescing filters. They all use filter media to trap solid matter. The type of filter you eventually opt for depends on the level of purity you desire for your compressed air. Each industrial application will put its own demands on the quality of air it needs to function efficiently. Industrial compressed air filtration can be a big expense, in that using the wrong filter can attract costs running into thousands of dollars per day. The potential damage of important machinery due to clogged filters and the subsequent effect on the installed pressure capacity is huge when you factor in, for example, a 300 horsepower compressor that runs around the clock. Some operations can have several of such compressors. After filtration, it is often important to regulate the compressed air’s pressure before it can be used. In some applications, like cooling nozzles and blow guns, the use of compressed air at high pressure can pose hazards. To ensure safe, efficient, and cost effective use, compressed air needs to be pumped at the right pressure. Pneumatic tools, for example, require specific amounts of air pressure. Using more air pressure than you need poses potential damage on your machinery due to excessive wear caused by the excess pressure. Besides, using more compressed air than is required is an expense as the excess air costs money to generate; yet, its use does not result in increased output. It is thus wise and economical that the air coming through the line is at the pressure necessary for the particular application. Anymore would be both a waste and a hazard. To ensure optimal compressed air usage, the compressor has to be able to stop when the air in the storage reaches a certain pressure level. This can also be determined by the maximum pressure needed for efficient filtration, usually the compressor’s cutoff pressure. An air compressor that runs continually wastes energy and requires constant maintenance due to faster wear and tear. Besides wear, the compressor will also produce too much heat, another source of moisture contamination that will need to be filtered out. ● The outlet pressure must not be affected by the flow characteristic through the outlet port. However, most regulators will still suffer from air pressure drops at the outlet valve. To compensate for this drop, it is advisable to set the supply pressure at least a bar higher than the outlet pressure. This ensures the system operates optimally, within its design parameters. These are the most common regulators, used in the majority of industrial processes where pressure control is important. They are a better choice over piston regulators as they tend to have superior flow. You have a choice of either a relieving or non-relieving general purpose regulator. A special feature of relieving valves is a vent hole that releases excess pressure to stop it from actuating equipment farther down the airline. The vent is a very small hole that is only effective as a bleed hole and can’t function as a safety relief port. Basically, these are control valves that can be operated remotely by means of pilot regulator. A benefit of this is easier maintenance of the regulator as the control spring on the main valve itself is rendered unnecessary. This leaves greater room for a larger diaphragm, which produces more accurate pressure readings when system pressure changes are factored in. But an important caution is not to use the pressure reading on the pilot valve itself, but to use the one on the slave/main regulator itself. This is because the two pressure readings are not usually the same. Another layer of accuracy can be achieved by adding a feedback pilot regulator. Essentially, this is a smaller valve connected to the outlet port of the main, pilot controlled regulator to gauge the pressure of the air coming out. The feedback valve relays this pressure signal back to the main pilot valve so it can determine if it is higher or lower than the desired pressure level. The pilot regulator then readjusts the pressure through the main regulator to the desired level. A feedback pilot valve is critical where an application calls for a large air supply at a specific, consistent pressure level. These regulators are used for applications – usually instrumentation – where the desired pressure repeatability cannot be achieved with normal regulators. Besides being unerringly constant, the pressure required by such instruments also has to be considerably lower. To maintain consistently lower pressure, the regulators have smaller outlet ports that have superior attributes for both flow and control. On top of that, precision regulators have a special bleed hole that continually removes excess air to maintain desired pressure levels. Although all the lost air through bleeding is a cost, it is necessary to keep air pressure at the prescribed limit. As a result of their precision and niche application, these precision regulators are a more expensive option. For even greater precision, these valves can be fitted with their own pilot control valve. In this case, the precision regulator itself becomes the main or slave regulator. For special applications that require super constant air supply at significantly reduced pressure, like paper rolling and belt tensioning, precision regulators can achieve as much as 80 to 90 percent reductions in pressure. They are incredibly precise. These are normal regulators that are modified, so they can meet certain constraints. These constraints are mostly in respect to the conditions obtaining in a given operational environment. The modification, or augmentation, can be a simple fashioning of hand wheels where a plunger operation would normally be used. Modification can also be determined by special materials used for specific compressed air applications. These regulators are thus an augmented or customized version of any of the three other regulator types. Your decision on the regulator type suitable for your specific application ultimately depends on the characteristics and special needs of your system. For some applications, air pressure and outlet flow do not need to be that precise. Yet in others, where precision regulators are deployed, air pressure precision is an absolute necessity. You may not even need a regulator if the inlet pressure is the same as that needed for your application. Ultimately, no regulator is better than another. Using a precision regulator where a general purpose regulator would do the job just as efficiently would be a waste. The regulator you choose simply has to be a fit for your purpose and not be unnecessarily expensive to buy, difficult to install, and to maintain. Where specific and constant air pressure and flow is required, then it will be prudent to install a precision regulator on the airline. Even with these more accurate regulators, you may still need to know the regulator’s specific relief capacity, as well as how sensitive it is to temperature changes. There are also regulators that come as a combo, connected to the filter. These are usually a lower cost alternative to separate units. Decide if those will be compatible with your specific application. To complete the air preparation process, the cleaned and regulated air will need to be lubricated, so the equipment with which it will be used can operate efficiently with minimal wear and as little resistance as possible. All moving parts within a piece of machinery must function without restraint. Otherwise, extra air may be needed to power them. The friction and resulting wear caused by lack of sufficient lubrication will also cause more frequent machinery breakdowns, which increase maintenance costs and shorten the machinery’s useful life. These are the most common lubricator type. They themselves come in two types – oil-fog and micro-fog. Oil-fog lubricators produce a heavier fog that is marked by larger oil particles that don’t spray very far. For this reason, this lubricator can only be used where it can be fitted not more than nine meters from the device it is to lubricate. Just as well, these lubricators aren’t suitable for use where the device being lubricated is on an elevated height higher than the lubricator itself. The force of gravity causes the lubricant to not be sprayed as high as the device to be lubricated is positioned. The other lubricator type - micro-fog lubricator solves these limitations by employing a special fog generator that atomizes the lubricating oil. This lightens the oil fog, enabling it to not only spray farther, but higher. Micro-fog lubricators are perfect for machinery with complex lubricator lines. Here, the dispensed oil fog can reach targeted areas without coalescing and depositing where it isn’t required to lubricate. The only tradeoff with these is the delivered oil is lowered by up to 95 percent. They are thus only suitable in applications where not much lubrication is required. Certain micro-fog lubricators, however, have a mechanism for adjusting the lubricant’s drip rate, so they can dispense the same oil as oil-fog lubricators. Both types of aerosol lubricators have non-return valves which enable immediate lubrication as soon the air supply is turned on. This lubricator can only lubricate specific parts of an industrial machine. Due to its design, it cannot continually dispense lubricant. However, it is an appropriate choice for applications, such as multi-spindle runners and conveyor chains, where the other lubricators will disturb airflow. As they cannot distribute oil as freely and widely as aerosol lubricators, injection lubricators can be installed on manifolds. That way, they can lubricate several points equally, at the same time. The amount of lubrication required for each application will differ. For example, pneumatic tools are particularly tricky. It is thus usually important to refer to manufacturer guidelines to ensure you choose the right lubricator. Depending on the application, expert guidance should be sought on how constant the lubrication needs to be, as the oil will be broken up and eventually lost as the system runs. 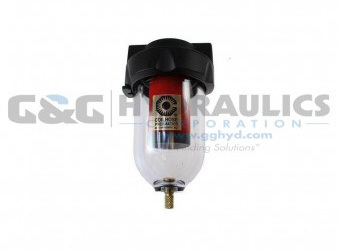 Lubricators come with different reservoir sizes. Where constant lubrication is required, it is critical that you choose a lubricator with a bigger oil reservoir, so you are not constantly refilling the reservoir. If you cannot get one with a big enough reservoir capacity for your requirements, you can always install a remote fill device or other such technology. Just as with regulators and filters, you have the choice to install a stand-alone lubricator, or one that is combined with the regulator and filter. Again this will be a cheaper option. But your final selection should be guided by your application’s special requirements for air purity, pressure, and lubrication. Compressed air needs to be cleaned of dirt and solid particles before it is used to power air tools and equipment. Dirty or contaminated air can damage equipment or cause them not to work at optimal levels. Likewise, some equipment also requires the compressed air pressure used to power them is kept at controlled levels to ensure consistent quality of products. On the other hand, some air tools have moving parts that need to be lubricated continually. Coilhose Pneumatics is one is the leading manufacturers of filters, regulators, and lubricators. These are offered as stand-alone units, as pre-assembled filter + regulator, and as filter + regulator + lubricant units. Coilhose Pneumatics has different series that are all targeted at different user groups.